One of us needs to allocate a separate zone in a small-sized room, while others need to separate the space in a large studio apartment. Some other people simply need additional storage systems. In whatever situation you are, the shelving as a partition is the best solution. It will effectively divide the space, become a roomy storage system and at the same time it will not require serious financial expenses and time for organizing the partition. In a room with one window it is impossible to build a solid wall to divide space into zones, because then one of the functional segments will be without a source of natural light. “Semi-transparent” shelving without facades and often without side walls will be an excellent solution for a small room. And you can stop thinking of limiting yourself in choosing a shelving construction in a spacious room. Use the most daring and original solutions. And the designers offer us a lot of options for creating modern interior racks. It is with such projects that we would like to acquaint you with a selection of shelving 100 models of shelving as zoning element & storage for modern interior used in a wide variety of spaces. Modern furniture stores for living space offer an incredibly wide choice of shelving, not to mention the possibility of manufacturing such custom storage systems. “Semi-transparent” models without back and side panels, facades and additional partitions – only horizontal shelves on partitions will be attached to the floor and ceiling in such constructions. Or opt to more thorough furniture options: with the facades at the bottom, built into the doorway. Or maybe mobile models that can be moved depending on the situation and the mood of the interior will appear more attractive to you? Options are countless. And they all have a number of advantages for being used as a partition. Versatile design. You can choose a model, both for a small room, and for spacious rooms. The shelf is easy to fit in almost any stylistic direction of interior design. It is important only to choose the right material and design. Another aspect of the versatility of the rack is the possibility of using in rooms with drastically different functional loads. Such a storage system is useful for toys, books and boxes of games in the children’s room. 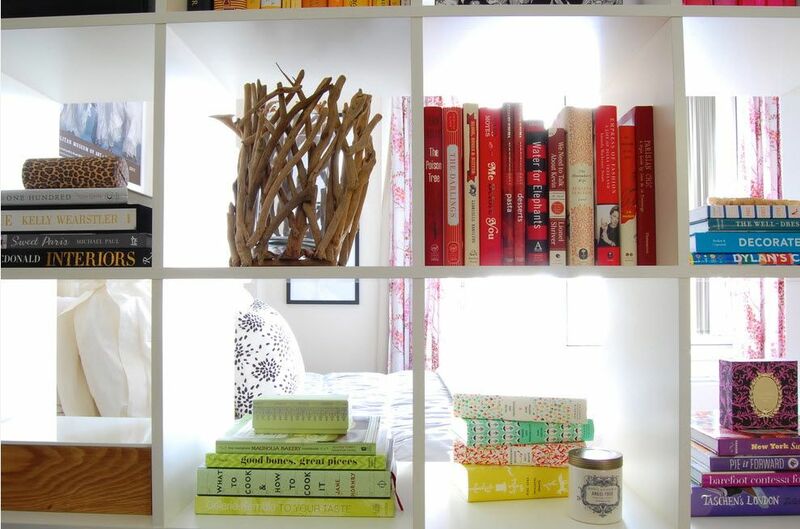 Or it can be used as a home library or for storage of wardrobe items in the bedroom and in the living room. It can be also applied as a partition between the kitchen and the dining room; the rack is useful for storing utensils and kitchen accessories. “Transparency” of the structure. If you choose a model without a back wall and sidewalls, consisting only of open shelves and jumpers, then the “transparency” of the partition will be abided. This product can be used even in a small room with a small amount of natural light. Democratic cost. Possessing a minimum set of tools and skills, you can build the shelf-partition by yourself. But also open shelves on the lintels will be inexpensive in the finished form, given the multifunctionality of this piece of furniture. Quick and uncomplicated installation of the finished product. It will not be difficult to install a ready-made design or assemble from a set of shelves, jumpers and accessories purchased in the store even for those who do this for the first time. Simplicity of design meanwhile does not detract from its strength and stability, durability and practicality. The obvious options for shelving, which are used in the premises as partitions, include the division of space (zoning) and performance as storage systems. In addition, the shelving can act as an accent element of the interior, attracting everyone’s attention and distracting from unsuccessful elements of the situation. Also, the partition wall can act as a decorative element, introducing notes of originality with the help of creative design. If you need to emphasize a functional segment in a small room with one window, then using a “translucent” shelving design is the best option for zoning. Unfortunately, many people are compelled to find separate zones in small spaces. 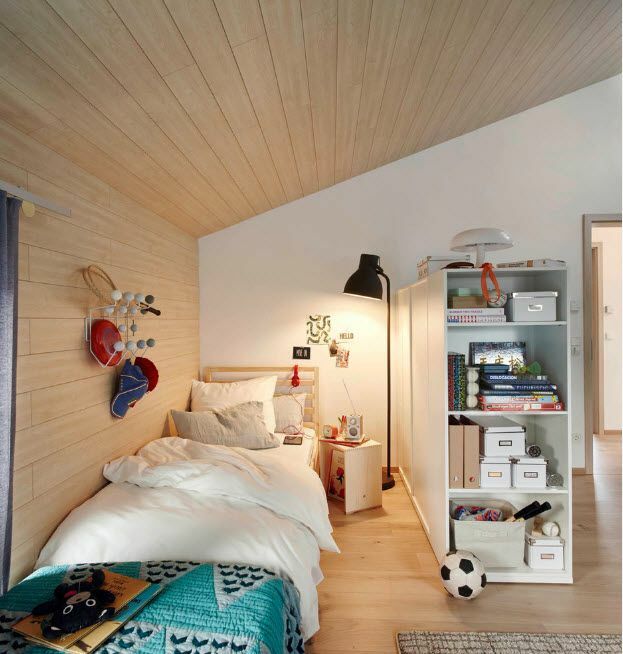 For example, in a one-room apartment it is often necessary to separate the parental rest area and the segment for sleeping from the child’s playground. 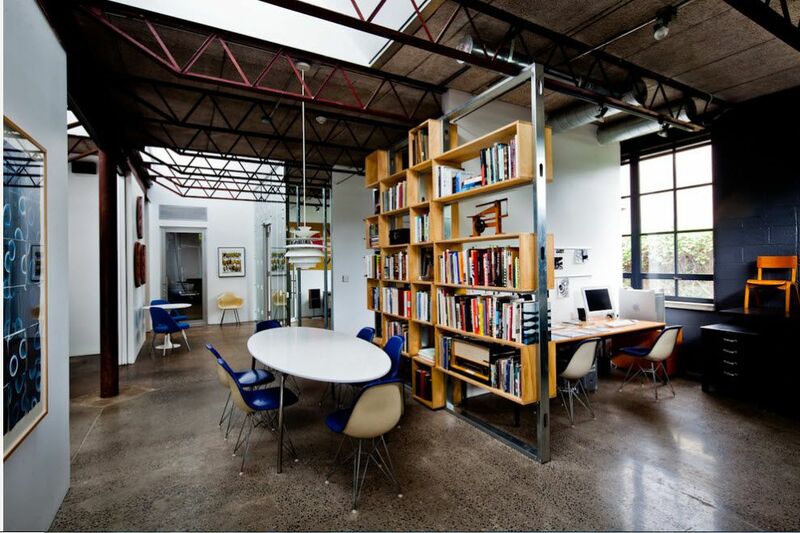 Shelving-partitions are most often needed for zoning space without the use of solid walls in spacious rooms. You can even use low shelving – the illusion of space separation will be preserved. And the visual volume of the room and the amount of lighting will be practically unchanged also. But some cases require a rack-partition from the floor to the ceiling. This zoning method will not become an obstacle in a spacious room with several windows. The advantage of partitions created in the form of shelving is that they can be used as storage systems. In some cases, this option becomes decisive in the choice of furniture for the interior, even without the need to create a fence for a particular functional segment. It’s hard to list everything that can be stored on shelves from traditional books to collectibles. Depending on the location in which the partition wall is used and which functional areas are separated, it also affects its content. Keeping books is one of the most common options for filling storage systems in the form of shelving. Books have no reason to hide behind the facades, in the bowels of cabinets or drawers. Beautiful roots of books not only help you quickly find the right work of fiction, but also to decorate the interior of the room, bring a variety of colors to the design of the room with a neutral palette. If the working and dining area of ​​the kitchen-dining room in the studio apartment is separated from the living room by a partition wall, then it will be equally efficient to store items that may be needed in all the listed above functional segments. It can be beautiful dishes, books on cooking, household appliances or simply decorative objects that harmoniously fit into the created environment. Another method of the dividing partition for the kitchen area in the common room is the superstructure of the shelving above the peninsula or bar counter. Practical from the point of view of its main purpose, the kitchen peninsula becomes part of the partition. Usually the addition in the form of a rack is reduced to the erection of laconic open shelves above the countertop. In a spacious bathroom, the partition wall can be used to separate the area for water procedures and the toilet. In such a storage system, you can place not only bath accessories and accessories for various water and sanitation procedures, but also a supply of towels for the whole family. The shelving can be used as a partition separating the areas of the dressing room in the bedroom. Obviously, the shelves of such a storage system will occupy the wardrobe of the owners. The shelving can be made transparent or place it at the wall. And you will be able to hang a picture or TV from the side of the sleeping area. In addition to the obvious options (i.e. the use of the rack as a storage system and the subject of zoning) this type of partition can also perform a protective function. For example, the partition wall located near the stairs not only zones the space, but also acts as a handrail, a protective screen for those who climb or descend the steps. A similar function is performed by the shelving located on the upper level of the room with several functional tiers. The simplest, yet incredibly functional version of the zoning interior shelving is a laconic structure made of shelves with partitions, without back wall and side walls. Such a model provides full access to storage items from either side, does not clutter up space and just partially blocks the spread of light. The universality of this model is that it can equally effectively be used in large and small spaces, in rooms with different functional load and stylistic design. No less common are partitions with partial overlapping of space. Most often, the closed part of the partition (monolithic or storage system with facades) is at the bottom. Its height is determined by your desire to create a particular level of blackout in the detachable zone. And the upper part is a translucent structure with open shelves. If the lower part of this structure is sufficiently wide, and the partition itself has a small height, then the top part need not be fixed to the ceiling. The structure will remain securely in the room without creating a threat of overturning. Otherwise (and especially in dwellings with young children), it is necessary to use the fastening supports of the upper shelving tier to the ceiling. The fixing of shelves to the ceiling will help achieve the safe location of even a very thin rack with a large height. Portable models of shelving-partitions are very popular. The advantage of these small-sized structures is the possibility of changing the layout of the partition (suitable for studio apartments), no need for dismantling when moving (it is important for those who periodically change their place of stay). For example, you can simply move the rack to the wall during a party in a studio apartment. Then, ensure the separation of the sleeping segments for the guests left overnight by getting it back. Often, these models of racks are equipped with castors having clamps. Office styled shelving is often used in residential areas. For example, it is possible to distinguish working and sleeping places by low office shelving in a children’s room for two or more children. In addition to the obvious zoning effect, such racks are excellent as storage systems for books, toys, school and sports accessories. Often, double-sided fireplaces are used as partitions in spacious rooms. A logical continuation of such a partition is the rack. It can be “airy” or “blind” design – it all depends on how solid your partition should be. The tandem of the rack-partition and the video zone is even more popular. Modern TVs are thin enough and do not weigh much. It is enough of a fairly stable rack with a back wall for combining storage systems with a place for watching movies and TV-shows in the living room or bedroom. A shelf-partition with swivel shelves and sections is difficult in terms of construction but a practical design. You can use a monolithic at first glance design equally effective on both sides – in two functional areas. For example, the TV located inside the shelves can be viewed from the bedroom and the living room.